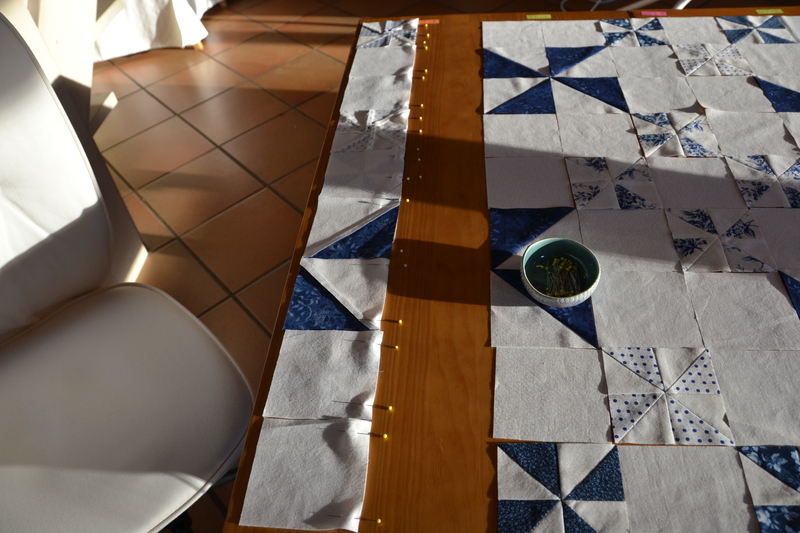 Well yesterday, I had to laugh as I read “Lucie the Happy Quilter’s Blog” post “To-do lists getting shorter…”. Though today, as I finally sit down to some blogging time and check my calendar, the laughing is over. I realize, “Oh gee whiz, I’ve less than two weeks until Christmas!!”. If I wasn’t enough stressed, now I realize, for sure that I have a good reason to be. The denial is over and I must make an action plan. Unfortunately, unlike Lucie, my to-do lists don’t seem to be getting shorter, but longer. I’m being pulled every which way by life’s normal everyday responsibilities and the wish to make Christmas crafts with my friend and finish this quilt top for my Windy Days Quilt. So why is it essential that I finish this quilt top soon? No, it’s not because it’s a Christmas gift. No, the reason is because of where I am sewing it. 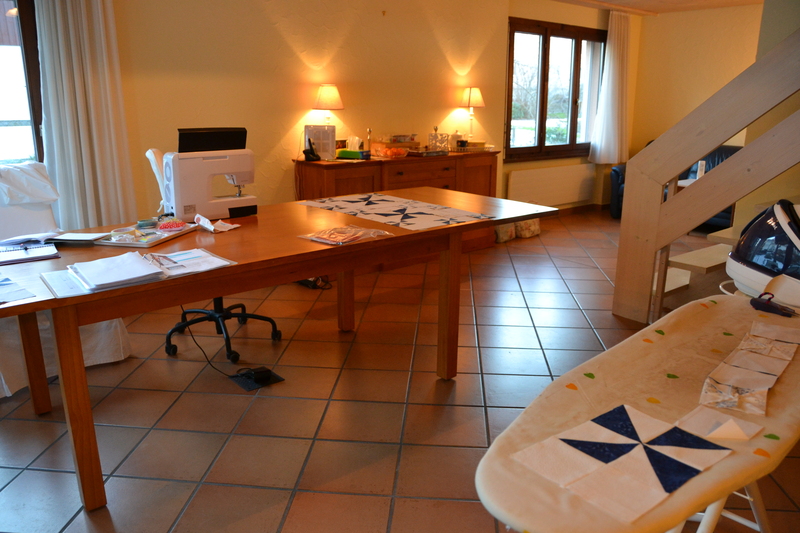 This is a picture of my current quilting space. Hubby doesn’t like it, because yet again, I’m ‘taking over the house’ but I had a little talk with him. I explained why it is so essential to do this on the kitchen table and how it’s the only place in the house, at the moment, where I can complete this top accurately and quickly. So this is where I will be stationed until the top is all sewn together. That probably means we’ll be eating on our laptop tables for a few more nights. When I hear Amy Ellis from “the Quilt Cast” talking about how her sewing space is on the kitchen table and how every night she has to pack up her quilting/sewing things so that she and her family can eat dinner, I think “How does she do it?” I mean it would probably take me a ½ hour each time I had to remove and set up, the sewing machine, ironing board and other supplies I need. And that’s valuable quilting time. Oh dear, the fog has really rolled in, so much for going for a nice walk! Looks like if I want to see the sun I will have to drive somewhere to do so. Ugg! Well any quilters or crafters out there, who might be reading this, I wish you a very productive day and good luck tackling any of your own to-do lists!